We can thank Game of Thrones for that moniker but it’s something that all Vermonters have known for generations – we cannot escape the winter! Granted, the weather this year has been funky but we’re still headed for months of snow and ice and cold. If we decide to reside in this great state, no doubt we’ve accepted this either happily or begrudgingly! The snow will be falling (hopefully) soon and that means we will be gearing up with snow shovels in hand. No doubt some of you have snow blowers to take care of the driveway (or even a plow service), but the snow shovel is still a household staple to clear porches, steps, and walkways. Even though we have a snow blower at home, I’m one of those crazy people who grabs the snow shovel instead. 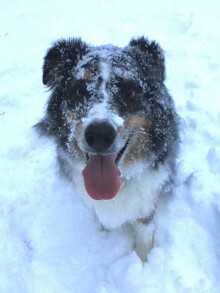 Not only is it a good workout, but my dog Sadie would have it no other way – she is a snow dog through and through! As a physical therapist, I see plenty of folks for back strains, sciatica, or worse after the first big snow fall, typically due to poor form or techniques when shoveling. Whether you are early in your snow shoveling career or looking forward to retirement, there are a few things we all can do to protect our bodies while participating in this time honored winter tradition. First of all, prepare yourself! That means putting on plenty of layers. 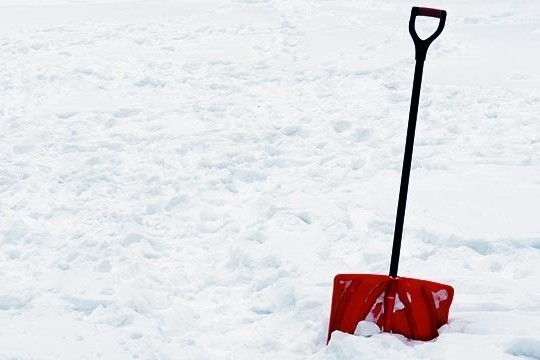 Of course you can shed these layers as the blood gets flowing and your body warms up, but it’s necessary to have them at the start because temperature affects muscle pliability – colder temps decrease muscle flexibility, thereby making them more likely to strain (become overstretched) while shoveling. A short dynamic warm-up before you get started will also help to improve blood flow and prepare yourself to shovel – think high knee marching, mini squats, arm swings, etc. Or you can be unconventional and just throw snowballs at your kids – that’s a whole body warm-up right there! Bend your knees to use your legs to lift (hello squats!) instead of bending at the hips and using your back. The muscles of your low back are designed to maintain the stability of your spine, not to produce large contractions to move heavy loads. That is what your quads (in the thighs) and your glute max (in the bottom) are meant for, so put them to work! Widen your grip on the shovel so that you can hold the snow closer to your body while lifting. Keeping the load closer to your center of mass actually reduces the amount of force your muscles need to produce in order to lift and dump the snow. Move your body as a unit for maximum trunk stability. Twisting or sidebending when dumping snow calls in other trunk muscles and puts them at risk for strain. It can also put you at risk for nerve compression or disc herniation, both of which we would like you to avoid! Third, shovel wisely. That means making adjustments for the type of snow you’re clearing or where you are clearing it from. Warmer weather (remember, it’s all relative) produces wetter, denser snow that is heavy, so make sure to collect less on your shovel when pushing it to the side. You may also want to start from the edges of your driveway/walkway/porch first so that you can better control how much snow you are trying to move. Don’t forget to take breaks and breathers along the way! Fourth, allow yourself to recover, especially if you have been outside shoveling for a while. The last thing we want is for you to fatigue yourself shoveling and then get hurt doing something else later that day! Recovery can be as simple as a short rest with a few stretches for the muscles of the arms and legs to make sure they don’t tighten up. An ice pack for 10-15 min is useful if you’re already feeling sore after shoveling. My favorite recovery is a warm blanket and a mug of hot chocolate while Sadie thaws out – trust me, those little ice balls need time to disappear! I hope this advice helps to keep you safe during the upcoming snow shovel season, whenever the weather finally decides to bring winter our way. Because as we Vermonters all know, winter IS coming!